Galentine's Day: (noun) February 13th, the other half of valentine's day, when you celebrate your love for your lady friends! 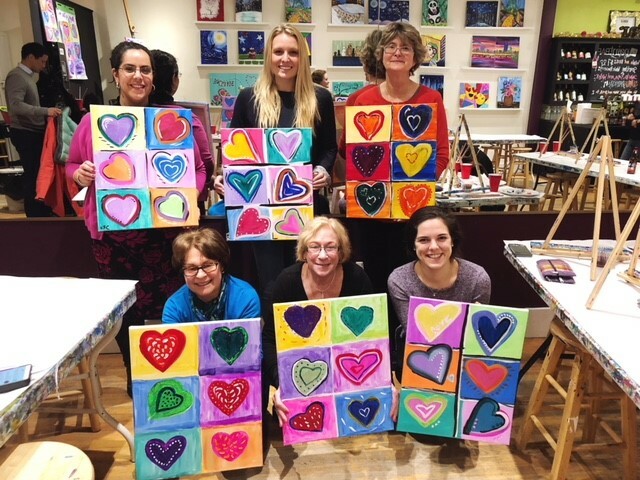 Last night, women of WBG gathered at the Paint Bar in Newton to celebrate Galentine's Day- a day for the girls. There were 4 members and 2 guests that attended. We set up our stations, filled our wine glasses and got our paint on! The Paint Bar provided festive chocolates and cupcakes and taught us how to create a heart inspired masterpiece on our canvases. This is such a fun activity to do as a group with hysterical comments on our creations, fun music in the background and some casual networking between laughs. We all agreed we will be doing this again soon, keep an eye on the calendar for our next paint night!